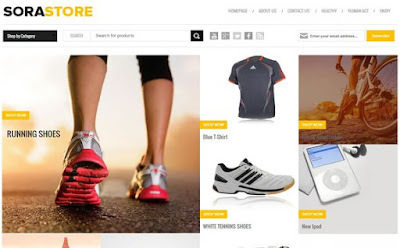 Sora Store is a responsive blogger template which is fully customizable and suitable for any kind of eCommerce store on any device. Sora Store is equipped with various of widgets which will help you to publish your blog more professionally. To make it easy for you we have published this detailed documentation, so that you can setup your blog correctly. Replace highlighted code with your feedburner id. Change this soratemplates@gmail.com with your own email. Change this USD with your own currency (Only Below Currencies are supported). Access your blog Posts > click Edit on any of your posts or add a new post. then switch to HTML area of the post editor and then delete everything and paste the following codes. Change the Blue highlighted link with your post link. Change the Red highlighted link with your product image. Change the Green highlighted link with your product price. Change the Yellow highlighted link with your Product Description. Red is for first, Blue is for second, Green is for third. Change the value of var pageCount=6; from 6 to any number you want (Archive). Only above listed currencies are supported. i want to change SORASTORE with my store name, how ? hello..can i change checkout paypal with checkout by email? How to customize the product size, when i upload product, it show up very large. You will get notified on your email and you have to reply them manually.